» How to verify spammer information is being submitted from XenForo? How to verify spammer information is being submitted from XenForo? Our site is run off of XenForo 2. On the recommendation from a friend, I requested an API key to enter for spam management. I manually entered in some information of a few spammers we had at our site just to see what I would expect to see under "My Spammers" and "Submission Stats". Since the key has been installed yesterday, our admins have removed at least 22 posts that were deemed to be spam using the spam cleaner. I've not seen any evidence that information has been automatically reported back, as it says it's supposed to do. Should I see them under "My Spammers" or in the "Submission Stats" section under my account? Is there a way to verify? Re: How to verify spammer information is being submitted from XenForo? You should see them in the "MySpammers", assuming they were submitted. On the "Submission Stats", I think that might take a while before anything shows. as it says it's supposed to do. Not sure what "it" is, and no clue as to what it says,... If you are using some kind of extension, mod , or plugin for XenForo 2, then you would need to ask them, about that. If nothing is being submitted , it must not be working as expected. There is an example of a manual submission here. If you do that from the command-line of your server, and check MySpammers afterwards (if successful, and obviously you need to be logged in to SFS), then you can prove to yourself if submission works, and possibly get an error message if it does not. After that, everything is within your own hands according to results. Don't forget to remove the rubbish-entry afterwards (or add actually spammers if you have full info). It seems XenForo 2 has the ability to automatically send information to Stopforumspam. I've added a snapshot to this post. I'd not used this before, which is why I'm asking if I should see results of it in my user panel. I was hoping there may have been someone else who is using this feature that could give me guidance on proper setup if I'd not done something correctly. But based on it saying just post in your key here and it will be automatic, I didn't think I could screw that up. Eventually someone may read this thread that also has XenForo 2 experience. 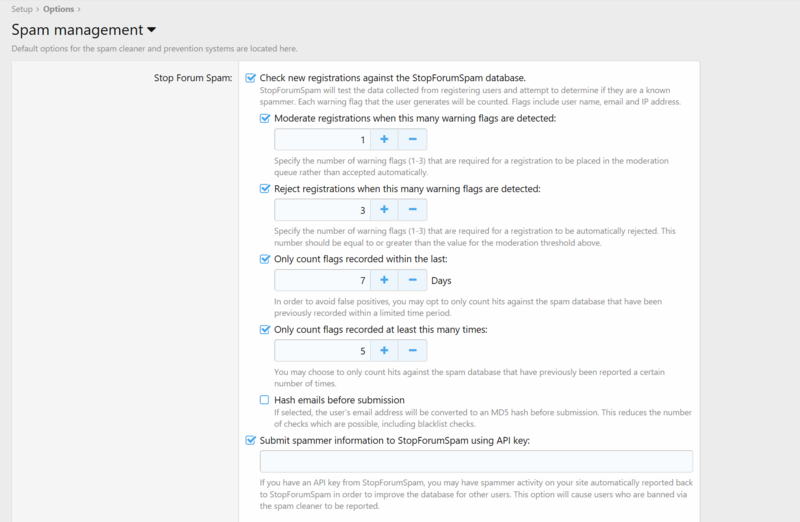 There are a tremendous number of forum software, and an even larger number of additions/extensions/whatever to allow spam rejection/reporting. None of the staff here have any of the relevant experience to be able to help directly. You have reported nothing from your logs, nor (it seems) tried a manual submission. Ah well. Seeing your screen capture, I don't see any API key, but perhaps did you blanked it (which is a good idea, an API key shouldn't be posted publicly)? I did remove my API key before taking the capture. It's not a plugin, it's inherent within XenForo 2 itself. that is to say, if the moderators, or persons doing the spam cleaning do not have the correct permissions, then it would not get submitted. I am not at all familiar with Xenforo 2, so can't really help on that. We do have a few members that use XenForo 2, but it is very rare they post anything, but maybe one will see this and have some additional info. I did do some manual entries, as stated in my first post. I do see evidence of those which verifies that the key is valid and correct. Just not sure where to go from here to verify it's working. I'm sure it's probably something simple that I've overlooked; I'm hoping someone that has experienced this sees it. I've also reached out to XenForo for some help with this as well. I did do some manual entries, as stated in my first post. Yup, but no followup on whether that worked or not. I do see evidence of those which verifies that the key is valid and correct. Report the error if you need further assistance.